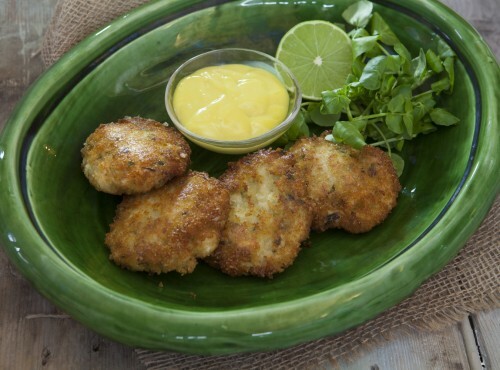 These crab cakes are a very simple and popular way of using crab. To clarify butter, melt and simmer bitter until the solids fall to the bottom of the saucepan, then ladle the liquid butter through a damp muslin cloth into a bowl. Mix all ingredients other than breadcrumbs and clarified butter, and taste for seasoning. Form mixture into 4 cakes. Spread breadcrumbs on a plate and coat each cake generously. Refrigerate until needed. Melt clarified butter in a frying pan. Fry cakes for about 3 minutes a side and transfer to a heated platter lined with kitchen paper. Offer a mayonnaise flavoured with chopped herbs, or a tomato or red pepper sauce, and serve with lemon wedges.